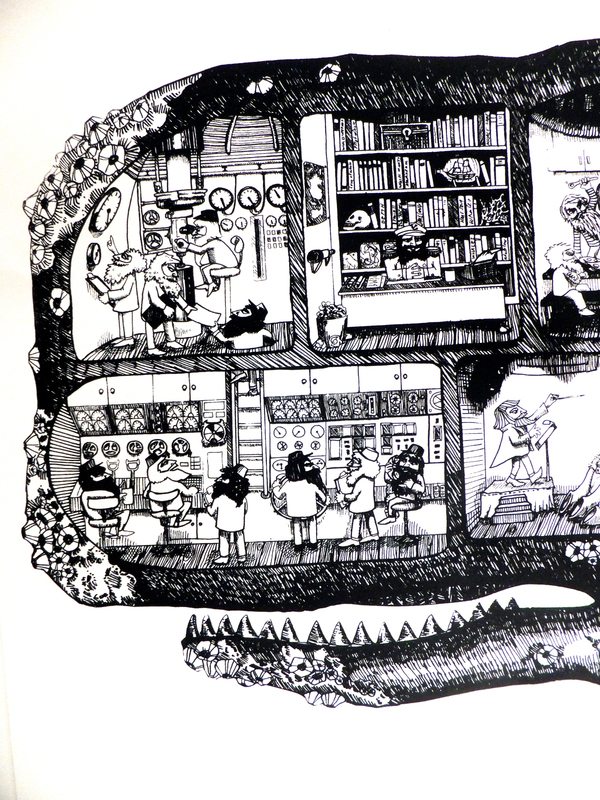 Check out this never-before-seen glimpse of the inner workings of whales and the men who man them! Ok so you’ve seen this before, but I’m here to tell you that the screen printed version is now available for purchase in my etsy shop! 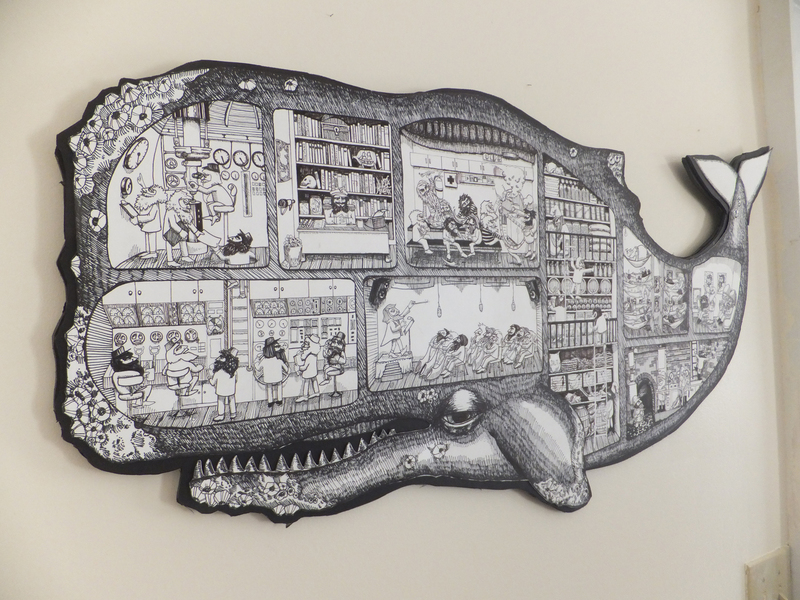 Each whale is so large it had to be printed in three sections with three different screens. 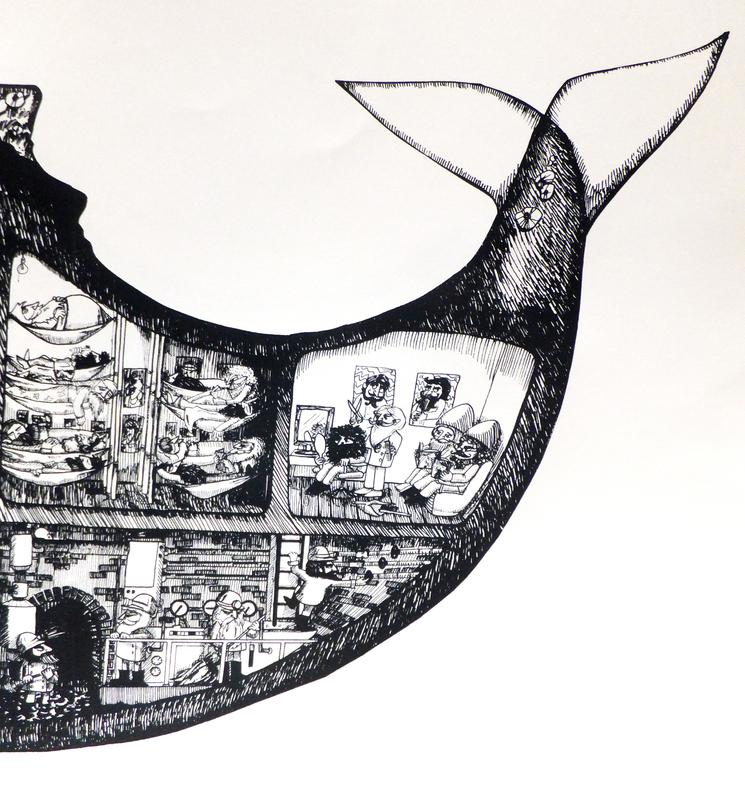 The paper measures 26″x40.” The whales took over my kitchen table and then the whole living room! I’ll compile a few ways people display it in another post, but it fits in a 27″x40″ poster frame which you can get for pretty cheap. 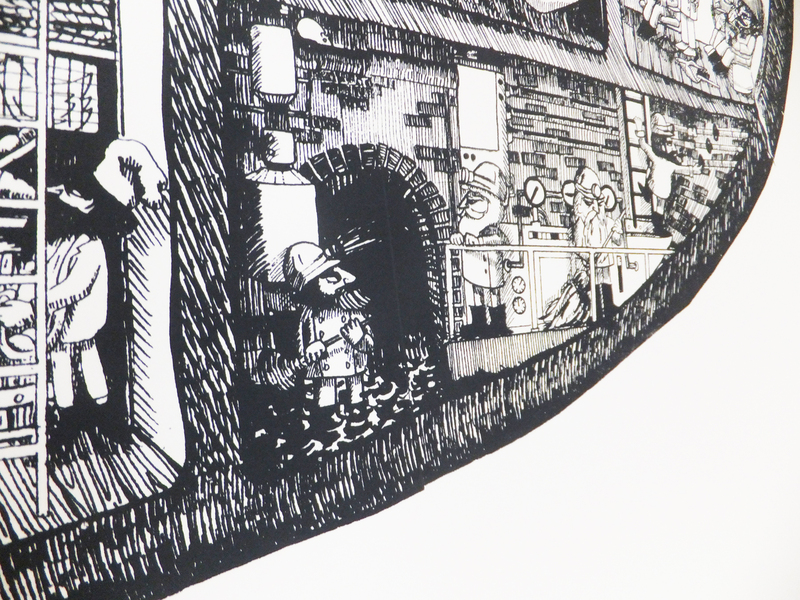 The top and bottom deckled edge of the paper show a little bit if you go this route. I really like the way mine looks, cut out and mounted on foam core. If you don’t want to frame it or cut it out, you can use clips to hang it on the wall like above. I’m also planning on printing some more sometime with wavy blue lines around them like the whale men in the calendar (January). I really loved drawing this cutaway, and I plan to do more like it in the future. I want to make more and more complicated drawings of scenarios and people and places that no one has ever seen in real life. 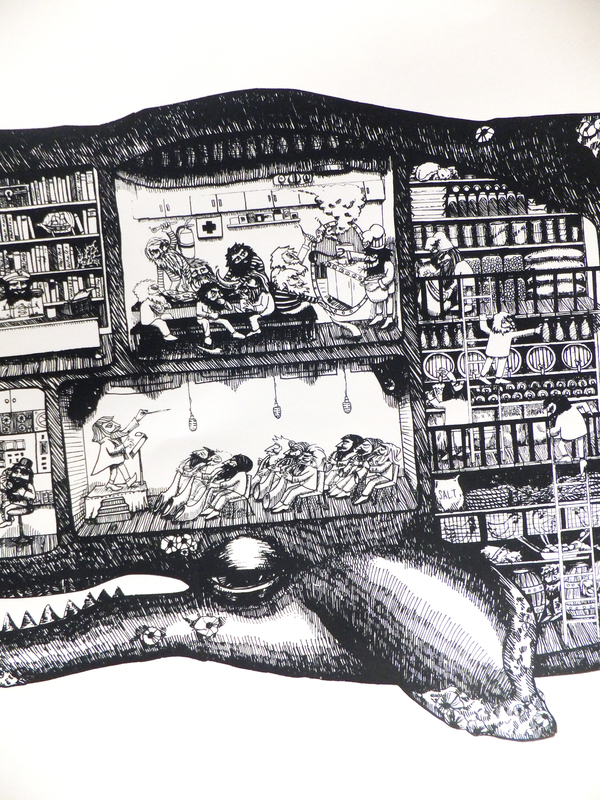 I imagined what these whale men would do and think, shut up inside the whale like sailors on a submarine. A few thoughts: The captain is a little overwhelmed; he’s very capable but this is his first captain gig and he’s a bit afraid of the rest of the men. So he stows away in his office a lot. The crew is furious that they are being served squid for the 100th consecutive day, and the cook (who does the best he can) is pretty hot-headed himself. The one guy that likes squid is trying not to draw attention to himself while still enjoying his meal. A famous composer/conductor was talked into coming on this voyage and has whipped these sailors into shape- they now make the most beautiful whale sounds in the sea. 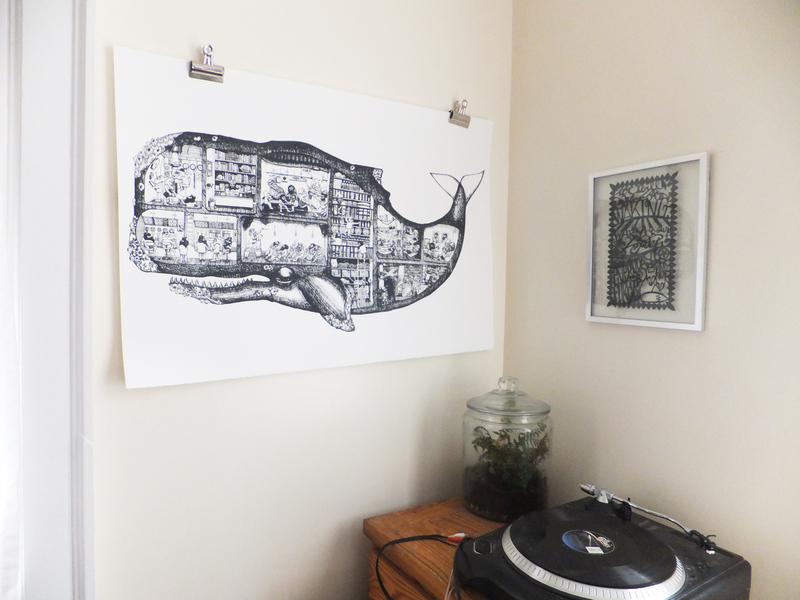 I hope these prints find a home somewhere where people stand around thinking and talking about the stories that they see in the whale. I am so lin love with your details!!! These are amazing. I wish I had seen it before now, I would have loved to have one. If you happen to make more, you should let me know. I will! I had some for sale on etsy, but I recently sold the last one. I’ll let you know when I print more. What are you doing these days?